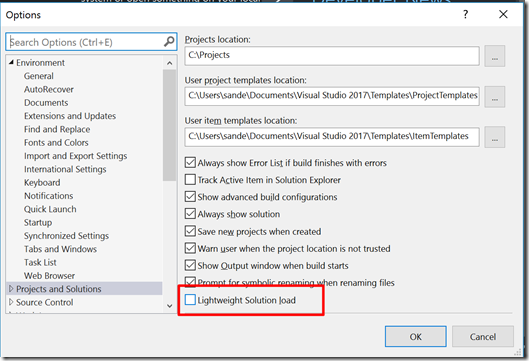 Visual Studio 2017 has a new option to load solutions faster. This is especially useful if your solution has several dozen projects. The option can be found under Tools > Options > Project and Solutions. As you can see, Lightweight Solution load is not enabled by default. 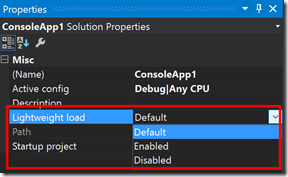 Once you switch it on, solutions files open quickly, but the underlying projects are not immediately loaded. Only when you select and open a particular project, this project will be loaded. So while you can open de solution rather quickly, there will be a small delay upon opening each project. Nonetheless, if your daily routine is working on large solutions, but only touching a few projects, this is a handy feature. An obvious request would be to have this option on a solution level. If you work on various solutions, some large and some small, it’s less convenient to delay loading of projects on every solution. Well, that request has already been fulfilled. 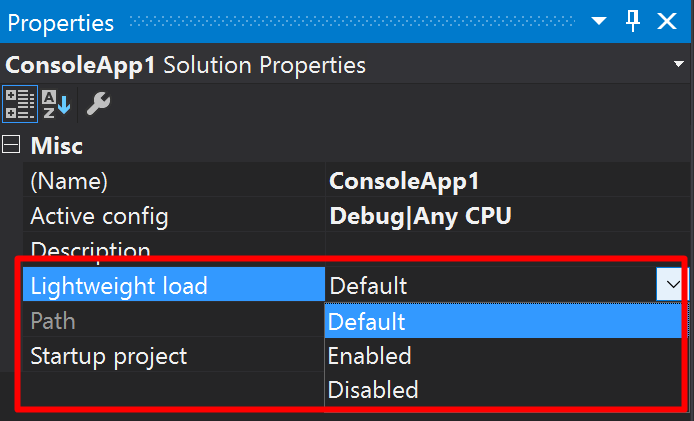 Check out the properties for the solution and you can select to enable or disable Lightweight load or revert to the Visual Studio setting.